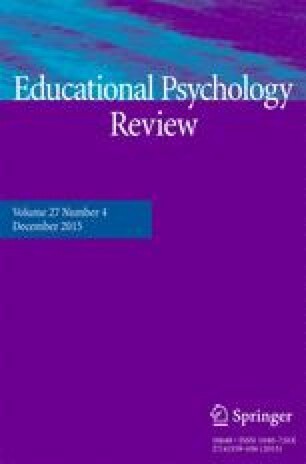 It is a great honor and privilege for me to be selected as Editor-in-Chief for Educational Psychology Review (EDPR). At the start of my 5-year tour of duty as Editor-in-Chief, the journal is in great shape. It is generally considered one of the flagship journals of educational psychology, thanks to the efforts and leadership of my predecessors, in particular Dan Robinson, Steve Benton, and Ken Kiewra, the very distinguished team of Senior Advisory Board members, the Editorial Board members, the anonymous reviewers, the contributing authors, and last but not least, the highly dedicated team at Springer: Garth Haller, Judy Jones, Charmaine Hilferty, and Mildred Alejo. Since the start of my academic career in the early 1990s, EDPR has always been my favorite journal. Not surprisingly, the journal has been the major outlet for my work, which is evidenced by the fact that more than 20 of my articles have been published in the journal since its inception 27 years ago. I think that the quality and breadth of the journal’s articles are excellent, some of its articles are the most cited in the field, and many of the contributions to the journal have broken new ground and made a real difference to the field. I consider it a great challenge to continue keeping this journal to remain the prime and most authoritative outlet for review articles in the field of educational psychology. However, the main challenge ahead is to continue the journal’s path to excellence and distinction. On the one hand, it seems that there simply cannot be a better point to start from. On the other hand, I am aware that the fantastic state Dan Robinson has left the journal in will make it hard to achieve further improvement. Nevertheless, I am confident that it is possible to maintain EDPR’s upward ascent. Apart from serving the primary mission to help produce the highest quality scholarship possible in the pages of EDPR, I have several priorities for the journal. In general, I consider it a collective effort of the Senior Advisory Board, the Editorial Board, and myself as Editor-in-Chief to guarantee the highest quality of the accepted articles while continuing decreasing the time from manuscript submission to online publication and to maintain and enhance all the conditions allowing that the most compelling, significant, breakthrough articles on educational psychology will find their home in EDPR. Although the time to first decision has already decreased from 50 days in 2006 to an impressive 25 days in 2013, I consider it a key responsibility to try to keep turnaround times on submitted manuscripts as low as possible. This policy will require extra diligence and effort on the part of our reviewers and myself as editorial leader, but it is important for attracting more high-quality submissions. Consistent with my own integrative and interdisciplinary research approach, I believe that respect for the diversity of perspectives in the field is of the utmost importance. In my view, this respect goes along with a sense of curiosity as to what others can offer to one’s own perspective and forms the basis for groundbreaking scientific work. In addition, I have noticed that some of my colleagues hold the misconception that EDPR only takes review articles. One of the challenges that I see is to make researchers aware of the fact that EDPR publishes a variety of articles including reviews, meta-analyses, intervention studies, replications, essays, interviews, commentaries, and reflections on the field. I believe that it is important that these articles not only emphasize theoretical and methodological rigor but also are clear and accessible for educational practice. Finally, it is important that the Editorial Board members represent a geographically diverse assembly of outstanding scholars with international reputations. The current team of 50 Editorial Board Members comes from 10 countries in 4 continents. I think that more diversity would be valuable. In sum, due to the magnificent work of my predecessors, the future looks bright for EDPR. I look forward to working with you on my new duties and hope to live up to the tradition my immediate predecessor, Dan Robinson, has established in the past 10 years. Your suggestions or comments for improving this journal are always welcome and can be sent to me at paas@fsw.eur.nl. Your submissions—whether reviews, meta-analyses, intervention studies, replications, essays, interviews, commentaries, or reflections on the field—can be sent to the EDPR portal at www.editorialmanager.com/edpr.